This place here in Tanah Rata is – And I can say it just after 1 night – like my second home. The owner Kassim is like a friend I had before we met. At the evening we all sat together and prepared a huge dinner. And Kassim – who is born in Bangladesh – was a good chef. We had serval of traditional Bangladesh dishes and all of them where spicy as hell. 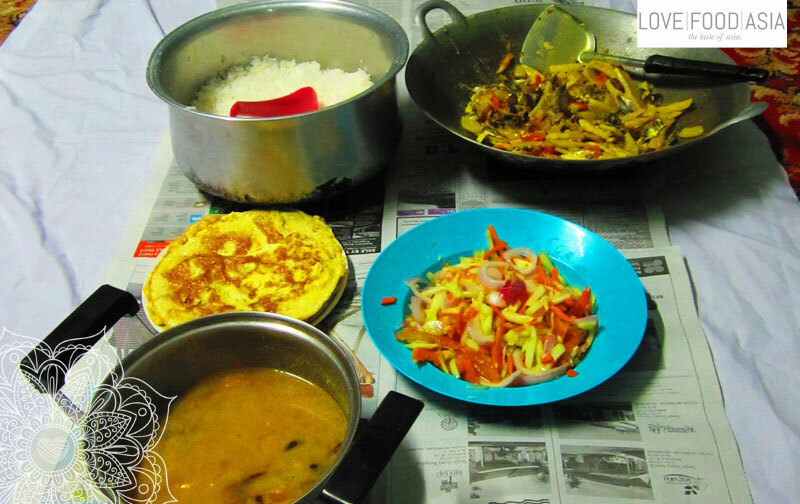 I´m really used to the spicy taste but this meal was not a meal for beginners 🙂 We had Bengali Dal, Spicy Omelet, Cucumber Salad and a simple (but spicy) Vegetable Curry. Everything served with rice. After cooking we took seat on the floor and ate everything with bare hands like they do in India or Bangladesh. It felt so good to have an experience like this. I don´t like to be in fancy restaurants or in expensive hotels. That´s the best way of traveling. To be with the locals and to eat with the locals. The Cameron Highlands are famous for its tea. And so we had serval of good cups of tea that evening.